Slim down, tighten up and feel terrific — just by standing up straight! If you want to slim down and boost your confidence, good posture is the first step. Standing tall projects to the world that you feel good about yourself, and it will make you look 10 pounds thinner…not to mention a few years younger! As we age, we need to pay more attention to our posture. By making a conscious effort to stand up straight, you fight the effect of gravity on the body. You’ll look firmer, more toned, and much, much younger. Medically speaking, perfecting your posture makes sense. Years of slouching can weaken your bones and put a strain on your internal organs. But when the spine is properly aligned, you’ll find you’re breathing more deeply, sitting more comfortably, and walking with more vitality. Walk your way to perfect posture, and watch the pounds drop! – The 3-volume outdoor Lean Walk CD is designed to help you break through your plateaus with fun music, motivational coaching, and maximum variety for maximum calorie burning. – The 2-volume outdoor Walk Fit CD is the perfect way to burn fat, because it combines steady state walking routines with interval “burst” training workouts. With energizing music and my coaching techniques, you can maximize the calorie burn of every step! – The Power Walk For Weight Loss indoor walking DVD brings the outdoors into your living room! The California desert landscape becomes a perfect backdrop for walking away the pounds. 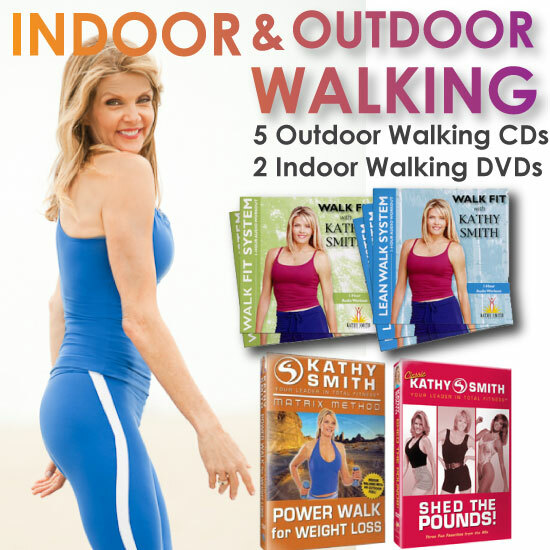 – The Shed The Pounds DVD includes one of my classic indoor walking workouts, March To Fitness. You’ll enjoy this fun, high-energy soundtrack with easy-to-follow walking and marching moves that offer a full range of intensity. You’ll have a blast and lose weight too!